In April 2002, Kathy and I took advantage of a special offer from Club Med and spent a week at the Club Med in BoraBora, French Polynesia. We thought this would be a nice vacation and maybe some ok diving. Well the vaction was good and the diving was Great. I had researched dive operations on BoraBora and found two major dive operations. We made arrangments to dive with TOPdive, http://www.topdive.com , mostly because you can sign up at the Club Med . Well this to turned out to be an outstanding choice. TOPdive is very well organized dive operation with nice facilities and boats, check my photos. 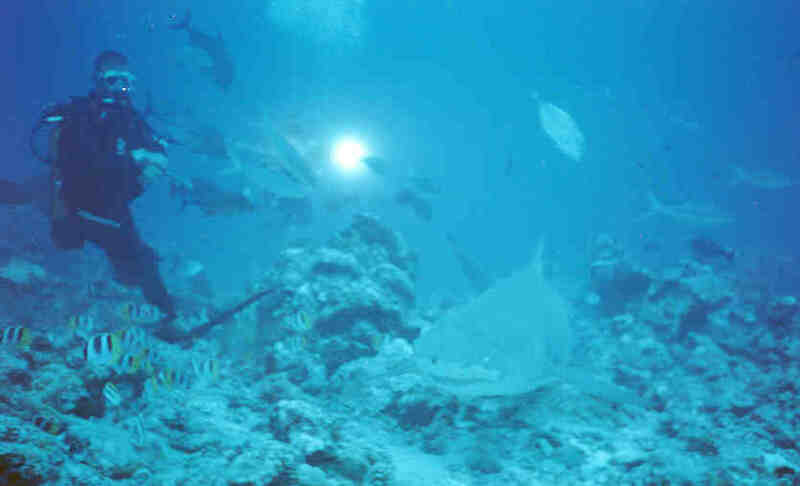 TOPdive offers four dives per day, however the afternoon dives are introductory type dives. TOPdive also has a hotel and restaurant as part of the facility. TOPdive furnished equipment as part of the price of the dive. A TOPdive representative would pick us up each morning at the Cub Med and drive us to the TOPdive resort in town. For the Manta dive the TOPdive boat picked us up at the Club Med pier, see photo. 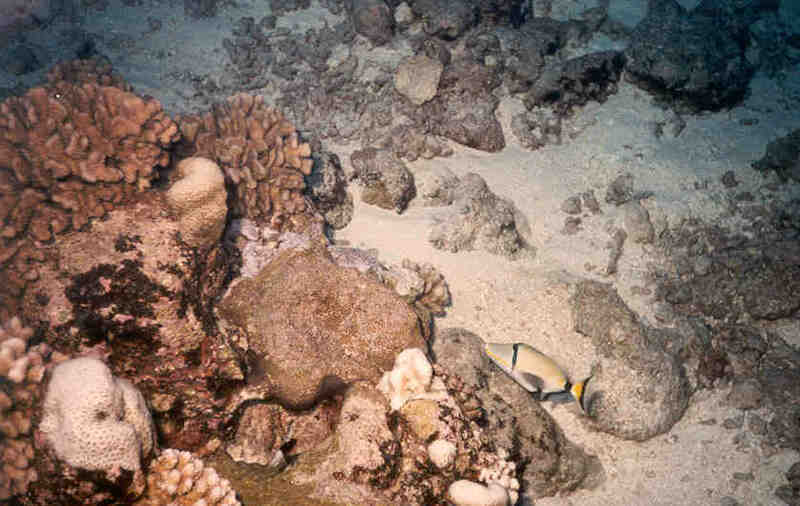 We saw more fish at BoraBora than on any other dive trip except to Palau. Palau remains in my mind the best diving I have ever done but it is very expensive, so if you want to see sharks, turtles, mantas, tuna, morays etc, BoraBora is an outstanding choice. If you consider going, I would strongly recommend the Club Med because it is a package price which includes meals and some activities. 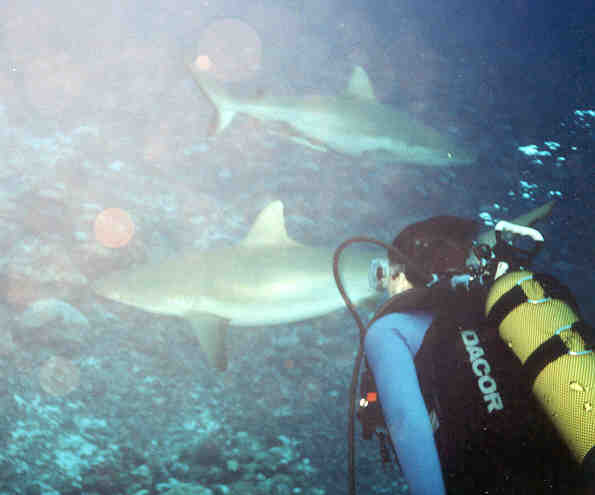 Kathy near two gray reef sharks, taken by me. Our dive with the Manta Rays was interesting. There were three or four. One was curious and after passing us, swung around and came right at me. The photo of the lemon shark was taken during a shark feeding. The lemon sharks tended to stay deeper. On several of the dives there were gray and black tip sharks all around us. The sharks and tuna were swimming right through our groups. The moray eels would come out of their holes and let the dive guides pet them. One turtle swam right up and looked Kathy in the face. Visibility was over 100 feet. The water temp was slightly over 80 degrees and many people did not wear set suits. the TOP dive equip was new looking and appeared well maintained. Several of the people we dove with said that the diving in Rangiroa was also very good. They recommened several days of diving in both islands.